Zhangjiajie enjoys a high reputation as County of Hard Qqigong, especially in Guanliping village at the foot of Tianmen Mountain. It is the order of the day for men and women, young and old to practice this style of Qigong. Among the practitioners, a man by the name of Zhao Jishu was awarded first prize in the National Martial Arts Competition in 1979. Thus honored, he accompanied some central governmental leaders for visits to Luxembourg was effusive in his praise for this international Qigong master and said this international Qigong master is real something. A Frenchman exclaimed that Chinese Hard Qigong displays true science and is a treasure shared by all humanity. 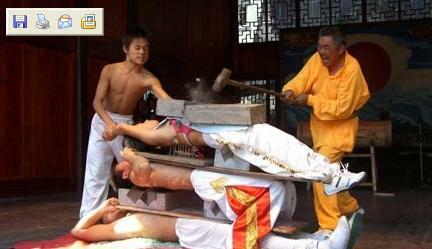 As for the performances, they usually involve lying face down on sharp steel forks, among other amazing displays. Though the performances are exciting and well worth watching, I am afraid that they might be a bit too stimulating for some people. It was reported that during Zhao Jishus demonstration in Luxembourgs national theatre, two elderly ladies became terrified and fainted. Located in the middle latitude of the north hemisphere, Zhangjiajie belongs to the mid-Asian sub-tropic monsoon continental climate, enjoying plentiful sunshine and rainfall. And in this area, there is no frozen period, and just short cold winter, warm temperature is about 16 ¡ãC. In a year, the hottest month is July, and the average temperature of this month is between 26.3¡ãC to 28¡ã C. while the coldest month is January, and the average temperature is between 3.5 and 4.3 ¡ãC. This region has plentiful rainfall, and the average annual rainfall is about 1400 C mm. All the districts and counties within the boundary of Zhangjiajie snow in the winter. If taking the amount of 0.1 mm snow as snowing day, the average annual duration of snow is 8.5 days, the most heavy snow year is 17 days, and the least snow year is 3 days. And the snow mostly falls between December and February, with an average of 4.2 snow days every month. January has the most snow, about half of the total amount. The plain area has less clouds than hilly country, and hilly country less than high mountainous region. For different seasons, spring has the most cloud, while autumn the least, the cloud comes out between 1 oclock and 7 oclock in the morning, and disappears between 14 oclock and 18 oclock every day.